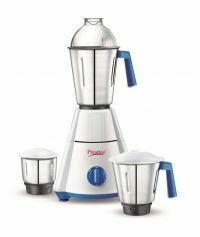 The mixer grinder comes with power packed 750 Watts motor for quick & effortless grinding of ingredients, It's flow breaker jar design ensures that food ingredients are pushed on to the blade for faster cutting/grinding action. thus saving time and energy. The jars are designed to perfection with superior quality stainless steel body with sparkling mirror finish. This super-efficient blade made of superior quality stainless steel can do better grinding of food ingredients according. The specially designed stylish jar handles provide better grip & durability. To Recieve updates and possible rewards for Prestige Nakshatra Plus please sign in. To Recieve updates and possible rewards for Juicer Mixer Grinder (JMG) please sign in.